Representatives from the Arctic to Australia have travelled to Peru to highlight widespread gender-based violence and other experiences of indigenous women across the globe. The World Conference of Indigenous Women has seen more than 200 women demand that indigenous women receive greater prominence at every level of decision-making. They are also calling on governments to provide adequate funding to meet the specific needs of indigenous women. Peru is home to one of Latin America’s most ancient indigenous cultures. 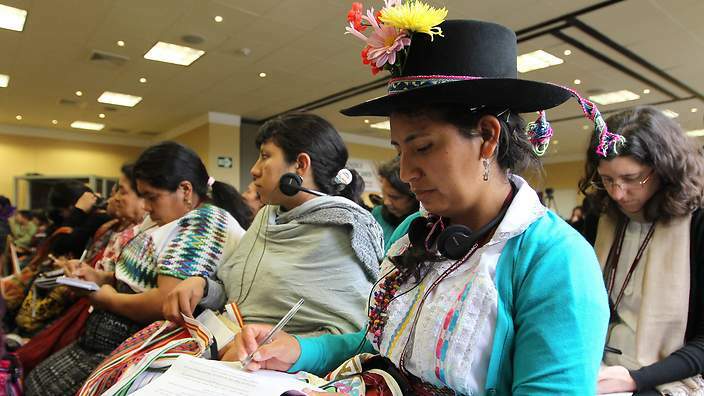 The country’s capital, Lima, has played host to the World Conference of Indigenous Women, bringing around 230 indigenous women together from across the world. They discussed many of the problems that are widespread in indigenous communities, sharing ideas and solutions. The conference is one of the key events helping to develop a political declaration to be presented at the World Conference on Indigenous Peoples in September 2014. Among those attending is Rose Pihei from the Autonomous Bougainville Government in Papua New Guinea. Mrs Pihei says one of her priorities is to reduce the widespread gender-based violence in Bougainville, which continues despite the island’s bloody civil war having formally ended in 2001. She says gender-based violence in her home country is getting worse, with more and more younger men perpetrating violence against women in rural areas where it never existed before. Medical aid agency Medicines Sans Frontiers estimates 70 per cent of women in Papua New Guinea will be raped or physically assualted in their lifetime. Meanwhile, ChildFund Australia released a report in August which revealed 80 per cent of men had reported using sexual or physical violence against a partner in Bougainville. Those attending the conference in Lima are discussing how nations can meet the United Nations Millennium Development Goals, such as reducing maternal mortality, which is higher in Papua New Guinea than any other Pacific country. Dee Thiele and Sandra Creamer represented Australia at the conference in Peru. Ms Thiele, who has worked in Aboriginal health for nearly 23 years, says many Australians don’t realise that Indigenous Australians face issues similar to those experienced by native people in other regions of the world. She says Australia still has a long way to go before meeting the Millennium Development Goal targets by 2015. Sandra Creamer, from the Global Indigenous Women’s Caucus, is attending the World Conference of Indigenous Women as an observer. She says the event is vital to helping address a range of issues affecting women throughout the world. Ms Thiele agrees, saying the conference is an important step in offering Indigenous women who work and live in communities experiencing these issues to share ideas.